Aidan Curran is an experienced marathon runner and the man behind the Run And Jump blog. Judging by the long queues for the portable toilets before the Dublin Half Marathon in the Phoenix Park last Saturday, for a lot of runners it’s a mid-race toilet incident. Even before shorter races, crowds gather anxiously at the portable toilets. Many other competitors just nip to the trees. The funny thing is that these are grown men and women who could probably drive for four hours from Dublin to Kerry while sipping large takeaway coffees, without ever needing a pit stop. But a race seems to send the bowels and bladder into battle stations. It might just be nerves. The portable toilet ritual relieves the mind as much as the bladder. Still, it’s the most common question I get asked by marathon first-timers: What do you do if you need to go to the toilet during the marathon? It happens to the best of runners. In last year’s Dublin Marathon, women’s race leader Maria McCambridge paid a quick visit to a portable toilet near mile 18 at Milltown and was all the better for it – she went on to win. So, if you have to go, you have to go – even when you’re on the go. The Dublin Marathon has portable toilets at the start-finish area and in previous years near each water station. Expect more queues, though. Of course, prevention is better than cure. I’ve said it before and I’ll say it again: your long runs and short races are your dress rehearsals for the marathon. If you find yourself scurrying to the bushes during your long run, then you need to look at your preparation. You don’t need to guzzle large quantities of water before or during a run. Not only is it ineffective, but it can also make you sick. Regular small sips of water during the day, every day – and not just on the morning of a race – will keep you properly hydrated. And during the marathon one bottle from each water station, drunk sparingly in regular sips rather than large gulps, should be plenty to get you around. Are you eating and drinking too much the night before or the morning of the race? Despite all the talk of carb-loading with huge plates of pasta, too much carbohydrate could leave you feeling bloated and constipated on race day, so make sure you balance those carbs with protein and greens. Fibre, caffeine and fruit juices at breakfast can also be stomach-troublers during the marathon. Have your breakfast eaten three hours before the race starts – and yes, that means six o’clock in the morning. If you intend to eat or drink during the marathon, then you need to practise on all your long runs to see if there are any ill-effects. However, unless you’re going to be out for well over four hours, you probably won’t need to eat anything during a marathon. And should those worse fears come to pass on marathon day, take heart from another top Irish athlete who ran in for a prestigious marathon victory despite stomach problems – and as a result had an unfortunate spray-tan job down the legs. As the world press prepared to take photos, this athlete hit on a quick fix by wrapping the lower body in a banner featuring the race sponsor’s name, a brand of dairy spread. Good thing it wasn’t Nutella. Email “What’s the worst thing that could happen to you during the Dublin Marathon?”. 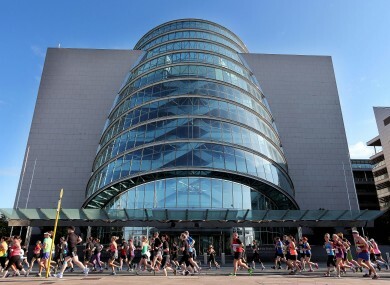 Feedback on “What’s the worst thing that could happen to you during the Dublin Marathon?”.